The working dinner at the French interior ministry – also attended by EU Commissioner for Refugees Dimitris Avramopoulos – was aimed at finding “a coordinated and concerted response to the migrant flux in the central Mediterranean (route) and see how to better help the Italians,” a source close the talks said. The four-way talks between Italy’s Marco Minniti, Thomas de Maizière of Germany, Gérard Collomb of France and Avramopoulos will also prepare them for EU talks in Tallinn this week. “The talks went off very well,” a member of the Italian delegation told AFP after the Paris meeting, with the “Italian proposals being discussed”. The source offered no other details. “We are under enormous pressure,” Minniti had said earlier on Sunday in an interview with Il Messaggero. With arrivals in Italy up nearly 19% over the same period last year, Rome has threatened to close its ports to privately-funded aid boats or insist that funding be cut to EU countries which fail to help. “There are NGO ships, Sophia and Frontex boats, Italian coast guard vessels” saving migrants in the Mediterranean, Minniti said, referring to the aid boats as well as vessels deployed under EU border security missions. “They are sailing under the flags of various European countries. If the only ports where refugees are taken to are Italian, something is not working. This is the heart of the question,” he said. “I am a Europhile and I would be proud if even one vessel, instead of arriving in Italy, went to another European port. It would not resolve Italy’s problem, but it would be an extraordinary signal” of support, he said. More than 83,000 people rescued while attempting the perilous crossing from Libya have been brought to Italy so far this year, according to the UN, while more than 2,160 have died trying, the International Organisation for Migration says. Italy’s Red Cross has warned the situation in the country’s overcrowded reception centres is becoming critical. “What is happening in front of our eyes in Italy is an unfolding tragedy,” UN High Commissioner for Refugees Filippo Grandi said on Saturday. If the order came, “we would have no choice, we would obey. But it would be completely impossible with more than 1,000 people on board,” SOS Mediterranee spokeswoman Mathilde Auvillain told AFP. After weeks or months spent in Libyan camps – where many migrants are raped or tortured – those rescued are already traumatised, “imagine adding two or three more days at sea. Our priority is to protect them,” she said. “We have to distinguish before they set off (across the Mediterranean) between those who have a right to humanitarian protection and those who don’t,” he said. 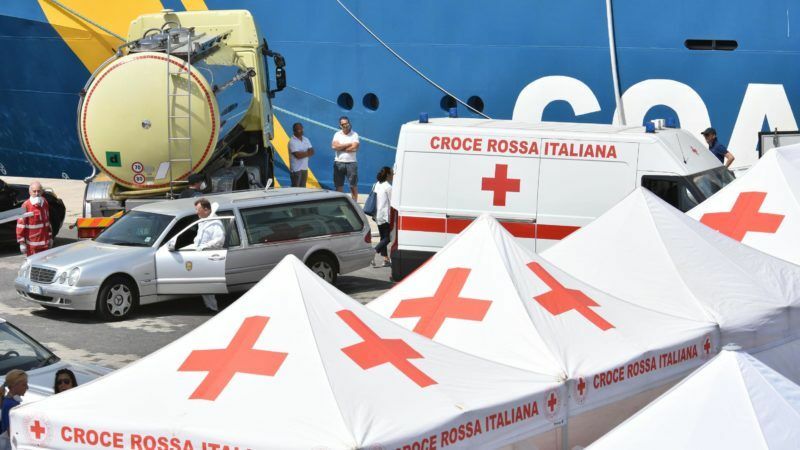 Unsourced Italian media reports said Rome was likely to call for a European code of conduct to be drawn up for the privately-run aid boats, with Corriere della Sera saying vessels that did not comply could be “seized”. And Italy insists that the EU refugee relocation programme – which is largely limited to people from Eritrea and Syria – should be expanded to include other nationalities, such as Nigerians, La Repubblica said. Italy and other rescue operatives are not rescuing , largely Africans , from the sea they are providing a major part of a safe transportation system from Africa/Libya to the nearest European ports in Italy , Europe . Africans and others are coming in ever increasing numbers to benefit from what is effectively illegal transportation to Europe . Both Italy and Greece are traitors to their fellow European Union states . It is one thing to rescue people from a sinking or disabled vessel off the shores of Italy ; but going to near the shores of Libya to collect them from huge unseaworthy rubber dinghies may satisfy personal moral ethic , in doing so they are putting at risk the survival of their own country and the whole of the European Union that could break up over immigration .